MESys AutoPellet boilers can be staged in parallel for large-scale heating applications. Savings are likely to be substantial for Staged Systems providing up to 765 MBtu / hr. Efficiency for large heating applications. Staged Systems run more efficiently than a single large boiler system because individual wood pellet boilers can be added or removed from service automatically, ensuring that at lower heat requirements the system is running at high efficiency. Large single boilers spend most of their life cycle operating at a lower heat outputs than designed for and offer substantially lower efficiencies in the field because of this. The MESys Pelletronic control system is used to stage boilers and automatically splits the amount of up-time between boilers during off-peak heating, ensuring the longest possible life cycle of each individual boiler in the Staged System. Partial load heating: big savings opportunity. While the question is often considered a simple one with only two possible system configurations, all oil or all renewables, there is a third option that deserves careful consideration when doing a cost-benefit analysis to decide when the time is right for your organization to switch to renewable fuels for all the benefits that entails. A part- load capacity renewable heating system has most of the fuel savings benefits of full system replacement with only 60-70% of the capital costs. 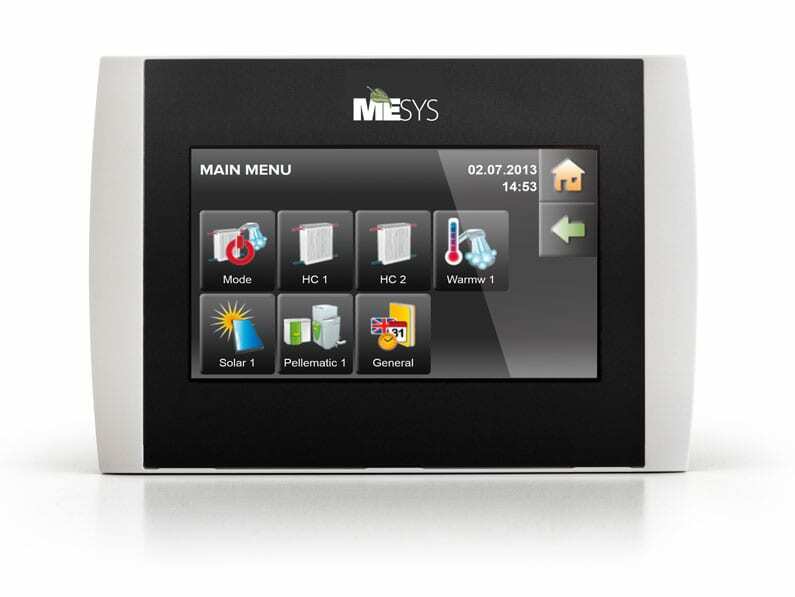 MESys Staged Systems are available with a touch screen controller for remote internet monitoring. The newly designed AutoPellet Touch is a modern touchscreen interface with a clear color display enabling quick and intuitive navigation. Track boiler performance, fuel consumption, and receive email alerts when it’s time to empty the ash bin.